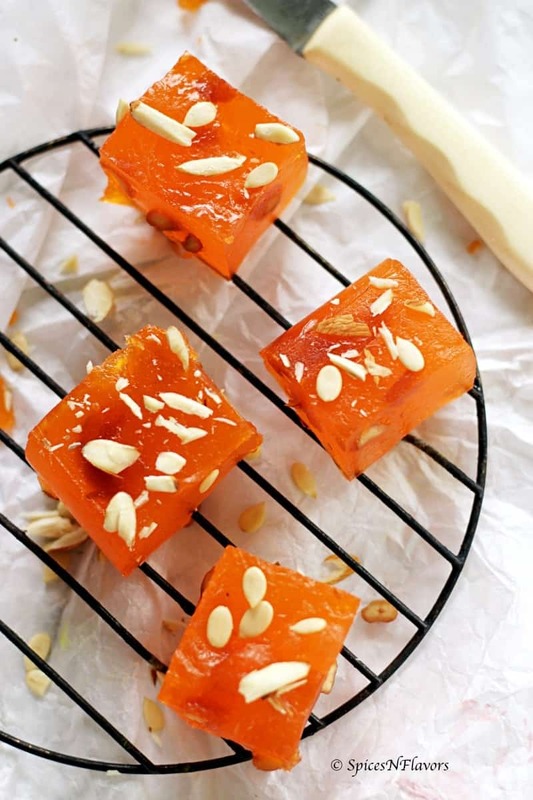 Bombay Karachi Halwa or what is also known as Cornflour Halwa is an Indian sweet delicacy that is primarily made using Cornflour, Sugar and Water; flavoured with cardamom and ghee. Perfect for any festive occasion. 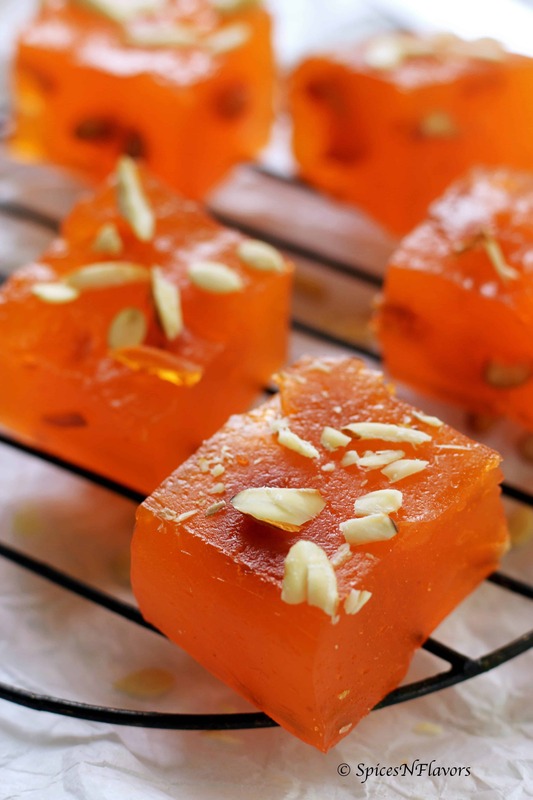 Bombay Karachi Halwa is a halwa recipe native to Sindhi community. 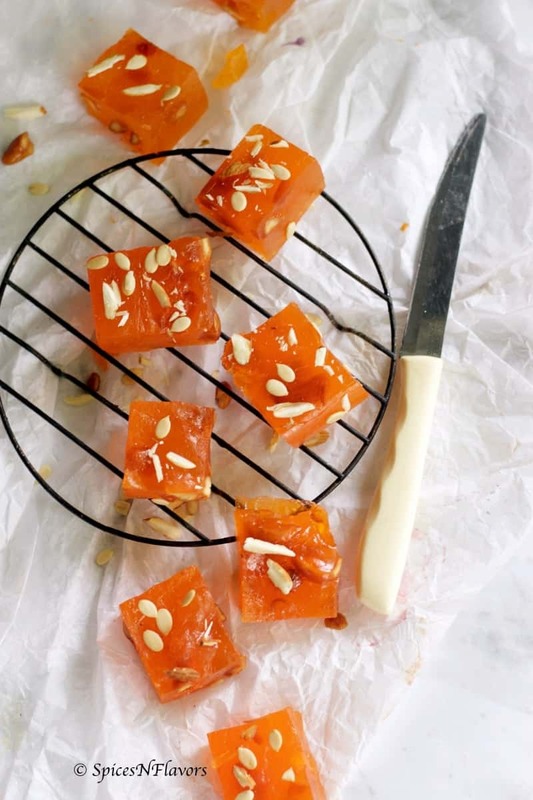 Even though we all love eating Halwa; we find it tedious to make it at home and hence tend to avoid making it. 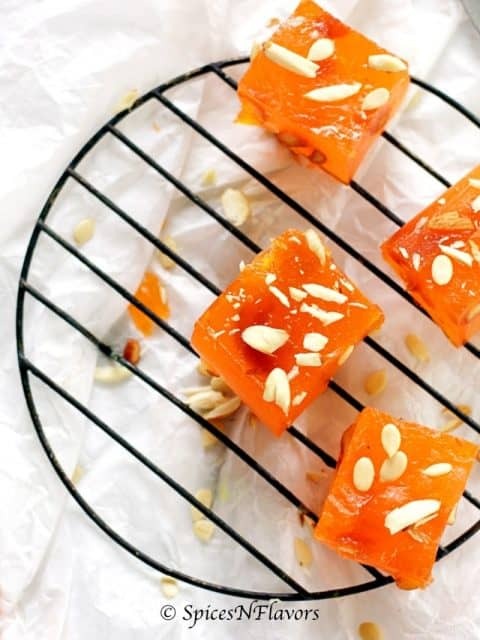 However this Bombay Karachi Halwa is one of those sweets that you can easily make at home in 15-18 mins without much efforts. Yes making it in Microwave makes the whole difference. No more baby sitting the kadai for this one. It is Ganesh Chaturthi tomorrow; one of the auspicious Indian festival. Coming from Bombay or Mumbai; I have a fond liking to this festival. I can imagine how festive it would be back in India now. How I miss it!! Modak being the most favourite sweet of Lord Ganesha; each and every Indian household would definitely make it tomorrow. 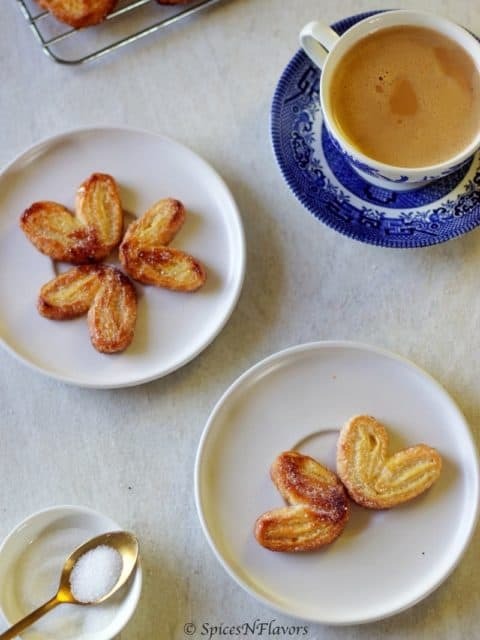 Yes my mother has also planned both the sweet and savoury version; what we commonly call as Kozhukattai in Tamil. I thought I should also make something for Lord Ganesh; what better than a easy Microwave Bombay Karachi Halwa. Perfect for all the working ladies or men who wish to help their wives. I have already shared this Bombay Karachi Halwa or Cornflour Halwa on the blog earlier from my initial days of blogging. Since that was an old one with not so great pictures; I thought of doing it again just to update it. And also to give you a quick and easy festive recipe. This recipe was shared to me by my dear friend Haritha Ganesh when I hardly knew anything to cook. 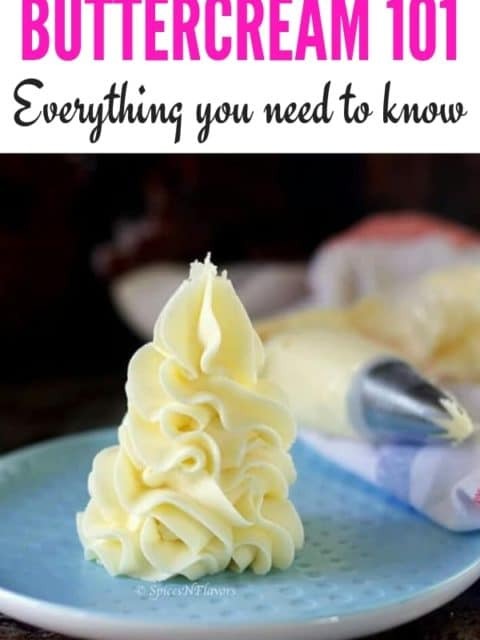 So making a sweet that is so flavourful and tasty was an achievement for me then. The same sense of feeling that I felt making this simple 3 ingredient Eggless Nutella Cookies last weekend. Do you like cookies? Comment below and let me know so that I can come up with more such simple cookie recipe. Coming to the Bombay Karachi Halwa; then this Halwa is so delicious and aromatic. The ghee is the hero of the sweet. That rich taste of ghee and cardamom combined with the right amount of sweetness would leave your taste buds tingling for more. And the fact that the halwa comes together in 15-18 mins is a bonus point and that too without any baby sitting or much efforts then its always a win-win. 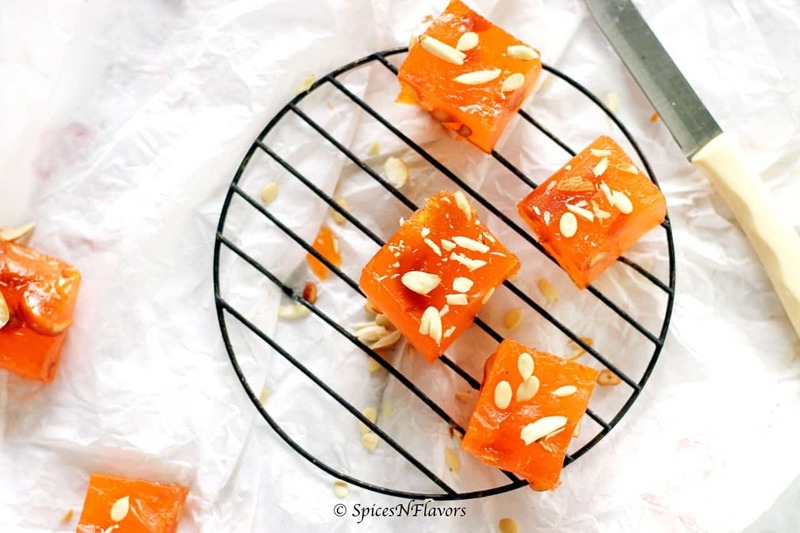 Make any occasion festive with this super simple and easy to make Bombay Karachi Halwa. And if you like this recipe then do tag me, tweet me or instagram me. I would love to follow you and your posts. 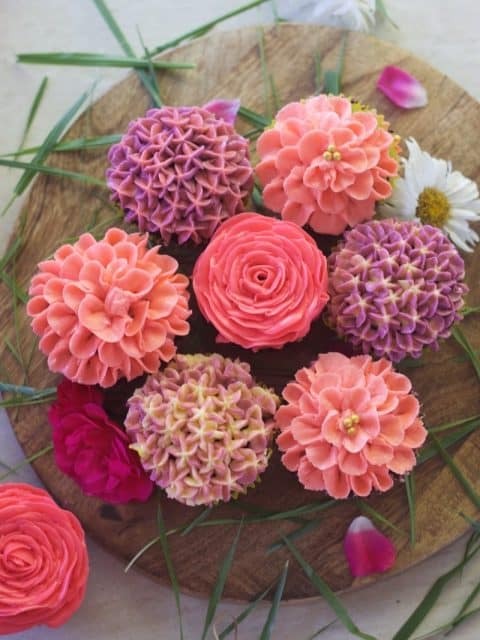 In a microwave safe bowl, combine cornflour, sugar and water until lump free. Add in the cardamom and food colouring. Mix to combine. After the first 6 mins, add in the roasted cashewnuts and the remaining 1 tbsp ghee. Mix to combine. Again microwave for 6 minutes. This time, remove the bowl out after 3 mins, stir and put it back. After 6 mins remove the bowl out, give a final stir and microwave for a final 6 mins. Once done, pour into a tin or plate that is greased with ghee and allow it to cool for 10-15 mins. Slice them up. Garnish with chopped nuts and these are ready to serve. 2. So in all we are microwaving for a total of 18 mins; with 6 mins interval in between. 3. The ghee is what gives this halwa a depth and flavour, do not skip it.